This weekend I read Suze Rotolo's memoir of Greenwich Village in the early sixties and (of course, prominently) her relationship with Bob Dylan. The jacket includes a blurb/puff from Joyce Johnson, whose Minor Characters is about life as a woman among the male Beats. Rotolo's editors knew what they were doing when they asked Johnson to write (and when they put her blurb first): this book, A Freewheelin' Time, is of a piece with other remembrances by women who were "there" (as we say) for the young manic/inattentive male genius on the rise. As a reader of this narrator's writing, I was sad to see the inevitable leaving-behind, and I was very consciously annoyed at myself for skimming past the Suze-only/Bob-not-there materials waiting for the next appearance of that magnetic minstrel. 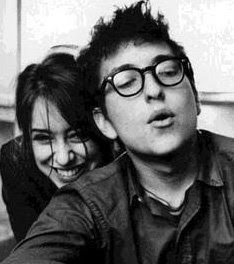 For downtowners of that certain era, and their fans, followers and chroniclers, Suze Rotolo was a sufficiently important and interesting and creative member of that community and deserves our attention with or without Dylan. Then again this book almost surely would not have come to us without Dylan's centrality (however eccentric) to it. There was something familiar about the way it was off-balance, unknown and freewheeling. It was oddly discombobuating to see a movie that made you feel you were in the next room. / I identified with the men in the film, not the women, who seemed insigificant in the midst of these wild, funny, and offbeat guys. I wanted to be them but didn't know how. I envied their freedom. / Many years later when I saw the film again, I was shaken by that memory. This time I was cognizant of the women and their role in the story. They were inconsquential and extraneous in the way a prop is part of a set. Suze moved out of Dylan's apartment before she became too obviously or too painfully peripheral to the scene that was forming around him. (Earlier, at the best moment of their connection, she spent a year in Italy living with her mother. Bob wrote adoring Dylanesque letters, which are amply quoted in this new book and constitute a reason for paying the money to buy it.) She managed to escape, sad as it was (for a while Dylan himself seemed to share this sadness). By the way, Suze and Bob went to someone's loft at one point and watched one of Andy Warhol's films, a work in progress. "Bob didn't think much of the film or of Warhol. His taste in movies could be quite conventional. Storytelling was important." It's clear that Bob's main introduction — in the months and first two years after his arrival in NY — to poetry and to politics was provided by Suze Rotolo. She was connected to the left (her parents were Communists and she, while no Stalinist, understood the radical variants) and generally to political theory — and to matters such as the Cuban revolution and civil rights. She was passionately interested in the experimental downtown theater scene and dragged Dylan along to various performances and happenings. The book has no index but ought to. Rotolo's references to the avant-garde world of that time and place constitute a new reference guide to Dylan's formative months — a chatty guide, an often clumsily written guide, but a guide nonetheless.